With considerable general marine industry design and fault analysis experience, and extensive fast ferry knowledge, AMD is highly qualified to provide engineering consulting services to designers, ship yards and ship operators. 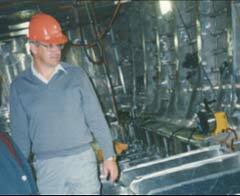 AMD can assist with design of steel or aluminium vessels, or consult on specific engineering and structural problems. With our considerable experience both in the design and construction of high speed aluminium vessels, AMD is able to advise on topics from the macro level of shipyard design for aluminium construction, right through to the micro level of bracket detail design to avoid fatigue failure. AMD is an ideal partner for a shipyard wishing to be successful in the high speed vessel industry. The technical operations of AMD are overseen by John Szeto, Managing Director and Allan Soars, Technical Director. 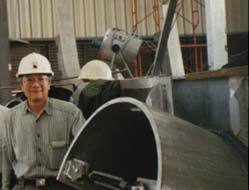 John Szeto completed a Bachelor of Mechanical Engineering with Honours at Sydney University in 1966, and began his career with Afai Engineers and Ship Repairers Ltd in Hong Kong. He became General Manager in 1975, where he was responsible for the company's ship repair activities and for their high speed craft building programme. Each year the Afai yard repaired an average of 550 ocean going ships, and built one or two workboats or fast ferries. In 1983 John moved to Australia, where he worked for six years as Director of Research for International Catamarans Pty Ltd. He joined AMD in 1989 as Engineering Director, and took over as MD in 1993. During his years in the ship repair industry, facing almost every conceivable mechanical and structural problem that can occur on a vessel, John honed his problem solving and trouble shooting skills, and certainly learned what worked and what did not. In his time at AMD this experience and skill has been applied to the design of the machinery systems in AMD's high speed vessels, resulting in consistent reliability throughout the AMD designed fleet. Allan Soars gained 4 years experience in the Mechanical Engineering field before joining Hercus Marine Designs in 1978, working on the design of steel tugs, trawlers and landing barges. He completed a degree course in Naval Architecture at the University of New South Wales in 1981, and worked as Naval Architect on International Catamarans' fast ferry development projects, attaining the position of Director of Technical Services. During his 11 year employment in the International Catamaran group of companies, he was involved in the design of over 100 high speed catamarans. Allan also joined AMD in 1989, in the capacity of Technical Director. Allan is a structural specialist, with considerable experience in aluminium, and has often been called upon by ferry operators to provide an independent assessment of structural failures, and to advise on the best solutions to structural problems. He has also provided structural design assistance to fast ferry builders, in one case being retained to optimise and upgrade the structures of well established high speed ferry designs.